Red clover is valued for its anti-inflammatory, antioxidant, calming, cleansing and demulcent properties. The active constituents of red clover are flavonoids. It is an ingredient in facial steams, cleansers, lotions and moisturizers and is used as a bath herb for many skin conditions including acne, eczema and psoriasis, as well as sun and wind damage. Red clover is used in lip balms for its soothing properties. It is also included in hair products for dry or damaged hair in the form of shampoos, conditioners and hair rinses. Recommended for normal-dry, dry and irritated skin, but particularly useful for chronic skin conditions. A species of grass, rice is the world’s third largest crop. The bran, called “nuka” in Japan, is a moist inner oily layer of the rice plant and often produced as a by-product of milling in the production of the refined grain. Rice bran has some constituents that make it quite unique including: the nourishing emollient squalene, the potent antioxidant gamma oryzanol, and a rich amount of four forms of tocotrienols plus tocopherol (vitamin E). Other active constituents include: the phospholipids - phosphatidylcholine, phosphatidylethanaolamine, and phosphatidylinositol - and high amounts of oleic and linoleic acids. Rice bran has been highly acclaimed for centuries in helping to create the flawless skin attributed to Japanese women. It is a gentle exfoliant and skin softener that also prevents wrinkles, quickly heals blemishes, absorbs dirt and oil from pores, balances sebum production and moisturizes. Rose otto is used in creams, lotions and soaps for its mildly astringent, mildly antiviral and bactericidal, balancing, cooling, deodorant, emollient, potent hydrating, skin conditioning and toning properties as well as its fragrance. The aroma is powerful and comforting. Recommended for dry-dehydrated, delicate-sensitive, normal-combination, tired-mature-wrinkled and traumatized skin. Rose and lavender facial cream is excellent for sensitive combination skin. Rose oil is used for cellulite, chapped skin, dehydration, eczema, sensitivity, stretch marks and wrinkles. Pure essential oil of rose is one of the most wonderful and highly prized oils included in perfumery. It takes about 10,000 pounds of roses to make one pound of essential oil, or 30 roses to make one small drop of oil. This intensely sweet, woody, deep floral top-middle note with rich spicy and honey-like undertones is known as the queen of essential oils. One of the most feminine essential oils, rose promotes unconditional love for self and others. It absorbs confusion, illness, imbalance, and negativity. It is common for heart surgeons to prescribe rose oil to their patients. Emotional benefits include enhancing: calm, compassion, confidence, femininity, fulfillment, happiness, healing, love, motivation, openness, passion, peace, rejuvenation, security, sensuality and sexuality, understanding and warmth. Further emotional benefits include reducing: anger, apathy, depression, disappointment, envy, grief, insecurity, insomnia, jealousy, loss of confidence, sadness, sexual fears, shock, shyness, stress, tension, vulnerability and feelings of emptiness. This uplifting oil also stimulates the heart chakra. See rose petals. Rose flowers are used in body care for their antiseptic, aromatic, astringent, cell regenerating and rejuvenating, demulcent, hydrating and vulnerary properties. Rose is recommended for: dry-dehydrated, delicate-sensitive, normal-combination, tired-mature-wrinkled, and traumatized skin. It is particularly effective in treating eczema, broken capillaries and wrinkles. Rose is beloved for its beautiful scent, and is currently used as an ingredient in dry and mature skin products such as facial steams, cleansers, lotions, toners, moisturizers and bath herbs. Rosewater has long been used as a toner and moisturizer by beauties to soothe sore complexions. Diluted, it can be applied to cotton balls and placed on closed eyes to reduce puffiness. It also makes a lovely mouthwash. For dry hair, roses are included in shampoos, conditioners and hair rinses. The rose is a symbol of balance, love and bliss and is an ancient symbol of love and beauty. Roses have the highest vibratory frequency of any plant and provide great wound-healing properties both emotional and physical. Placing 2 roses on your bedside table is said to assist you in your dream state. Rosehip Seed Oil: A natural, bio-available source of vitamin A, which helps to delay the effects of skin aging, assists with cell regeneration, and supports collagen and elastin levels. Also has high amounts of polyunsaturated essential fatty acids: omega 3, 6, and 9 (important skin nutrients), also vitamin E, an important lipid-soluble antioxidant, protecting cell membranes from oxidation by removing free radicals. Other active substances are tannins, flavonoids, vitamin C and beta-carotene. Used topically to treat wrinkles and to moisturize and revitalize skin at the cellular level. Rosehip seed oil can penetrate to deeper layers of the dermis, where it invigorates the production of collagen, elastin and hyaluronic acid, which establish skin firmness and elasticity. The fruit of the rose is a berry-like structure called a rose hip. Rosehip seed oil is a good emollient and contains vitamins A, D and E, antioxidant, and is among the richest sources of vitamin C of any plant. Pure rosehip oil contains around 75% fatty acids: oleic and the EFAs linoleic and linolenic, which help maintain healthy skin and supposedly reduce the appearance of pores. Rosehip oil is the only vegetable oil to contain natural tretinoin, a derivative of retinol (vitamin A) at ~125mcg per every 100g, which replenishes and helps rebuild skin tissue and is great for acne. Other active constituents include: tannins, mucilage, proteins, phospholipids, fruit acids (exfoliating), sugar (exfoliating), and carotenoids. Rosehip oil is proven to delay the effects of skin aging by aiding in cell regeneration and boosting levels of collagen to create smoother, firmer skin. It can be used to strengthen weak fingernails and thin or damaged hair and has proved useful in reducing and eliminating the effects of dermatitis, eczema, fine lines, hyper-pigmentation, lumps from scarring, over-exposure to the sun, psoriasis, scarring, skin burns, stretch marks and wrinkles. It is used in massage oils for sore muscles and cellulite. Other uses include toothpastes, mouthwashes and insect repellents. Scalp stimulating rosemary is popular in hair products in the form of shampoos, conditioners and hair rinses to help darken gray hair and improve dandruff, hair loss and premature baldness. 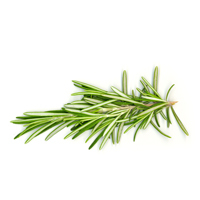 Rosemary extract is also an excellent natural preservative and is more stable than vitamin E (a popular preservative). Essential oil of rosemary is described as a strong herbaceous, fresh camphoraceous top-middle note with woody-balsamic undernote. This energizing oil has a very old reputation for improving memory. Emotional benefits include ease of: aggression, anger, exhaustion, emotional and mental fatigue, headaches, mental strain and physical fatigue. Its active constituents include: terpenes, tannins, rosmarinol acid (named after the plant and a potent antioxidant), caffeic acid, flavonoids, sterols, the saponin oleanolic acid, lipids and salicylates. Rosemary’s Latin name translates to "dew of the sea.” It is touted as a “new generation antioxidant.” Rosemary leaves are antibacterial, antiseptic, astringent, demulcent, rejuvenating, skin conditioning and stimulating. Rosemary is best for blemished, oily and dull skin and is used for the following skin conditions: acne, seborrhea and cellulite. It is widely used as in facial steams, cleansers, masks, toners, lotions, moisturizers and soaps. When used on the skin it helps to strengthen capillaries and improve sluggish and mature skin, poor circulation, arthritis, rheumatism and infection. As a bath herb, rosemary acts as a muscle relaxant and analgesic, yet revitalizes tired limbs and helps the mind to be alert. Rosemary Verbenone: One of the “Oils of Protection,” known for its regenerating and stimulating properties to the skin, hair, joints, respiratory and nervous systems. Its warming, invigorating qualities stimulate blood flow and tissue regeneration, which in turn brightens dull skin, and effectively treats acne, eczema and psoriasis. 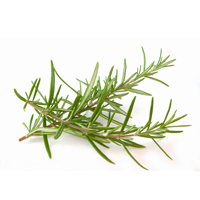 Rosemary verbenon essential oil is colorless or pale yellow, and has a strong, fresh, clear woody aroma. It is analgesic, antidepressant, anti-rheumatic, antiseptic, antispasmodic, aphrodisiac, astringent, cleansing, fungicidal, nurturing, regenerative, stimulant and tonic. It is known for stimulating new cell formation. Rosemary verbenon can benefit all skin types but is particularly good for wrinkled, devitalized, mature, acneic, burned, scarred and sun-damaged skin. It is also good for rheumatic and muscular pain, especially tired and overworked muscles. It has a warming effect on cold limbs and provides a stimulant for the scalp to encourage hair growth and treat dandruff and greasy hair. Its emotional benefits include an ability to clear the mind and the emotions, promoting mental clarity. It also provides an uplifting boost to confidence.